Let's have a discussion. Seeing as last year we tried to build up a new RP and it randomly collapsed, what should we do for this new forum? Should we try and set up a new system or should we just let people do their own thang on the RP forums? I have so many mixed feelings on this. My heart yearns for the old system (which you and I ROCKED, by the way), but my head tells me that scrambling to set up a system, no matter how loose or detailed, wouldn't be a good idea just yet. Which would mean I'm inclined to say "Just let everyone do whatever." But then what if we plan to introduce a formal system somewhere down the line? How many people would be receptive to it? "We LIKE being able to run things our own way. Why should we have to conform to your silly rules NOW?" Cue pitchforks. So to put it simply... I haven't a damn clue. I know what I'D like (similar structure to the late 2000's), but it just doesn't seem practical right now. i would love to see the boards have another RP, but in terms of rules/form, I think something similar to the original RP would be more liked by everyone. @Blade Lord S-IX: Tell me a little more of the Celestial Alliance RP. <- Eight Roads is an Air Gear RP. Super fun! Hey Speedy, if (big if, i haven't spoken with the staff about it yet) we decide to support the RP you speak of, you wouldn't mind it being hosted here, would you? Arrangements can be made if all parties agree. @Fal, You'd have to take it up with Mel, since she's the creator/owner etc. Do you mind directing her here? Personally, I think the best approach is to take the time to work out a functional system (reminiscent of past systems, Skylessia in particular - I had loads of fun with Sky) and allow everyone to do their own free-form RPing in the mean time. Should they create their stories with existing characters, let that be their decision - should it be a fan-fiction type of roleplay, that would work too. I myself enjoy a structured RP system as opposed to open-ended, free-form RPing. Once the RPs are up and ready, let people do their thing in its own section, similar to how it was in the past, and then have our structured, world based RP. (01-24-2014, 12:16 PM)Falaflame Wrote: Hey Speedy, if (big if, i haven't spoken with the staff about it yet) we decide to support the RP you speak of, you wouldn't mind it being hosted here, would you? Arrangements can be made if all parties agree. Not exactly sure Meneil would like to bring the RP here, I'm not talking for her, but we separated from FEP when the forum had some IPS errors and the RP isn't related to FETO anymore. My point of view on it it that it currently works fine on the other forum, even if we don't post every days. We already had to move once, and we lost some members in the process. If it moves I'll move with it, but for the moment, I think it's better to leave it there. Alright, fair enough. Don't worry too much about it then. People are super srs about their rp's. I'll keep that in mind. There'll be a good system in place by the time we start a serious RP over here. Not to say you can't start one already, but the way I saw Sky and etc. integrate with the old site is almost freakish. I loved the hell out of Sky for as brief a time as I was around. As far as whether or not people will be supportive of a new organized roleplay after however long of doing freestyle, I think that the appeal of that organization is that it gives roleplayers something they can't really do in twos and threes. Sky, for instance, gave us at least some sort of premise and plot and movement, and the world was dynamic based on the actions of our characters. It was a framework to operate from, and that's a really appealing thing for any roleplay. So yeah, I think people would join, as long as it's interesting and fresh and whatnot. I think it's too early for an organized roleplay system. As much of an advocate as I am, I know it would just fail if we didn't have enough members (no matter how well organized it would be). I personally want to create a brand new roleplay system over simply porting one from some other site. (01-26-2014, 07:02 AM)Sui-kun Wrote: I think it's too early for an organized roleplay system. As much of an advocate as I am, I know it would just fail if we didn't have enough members (no matter how well organized it would be). It's also worth mentioning that there were a fair number of users on the old site that were there JUST for the RP subforums. We already know what kind of basic structure is successful - if we were to shape a new setting around that, it would cater to old members familiar with that structure, as well as provide an interesting new world for the newer ones to latch onto. Originally we ported Celestial Alliance to a different site due to the IPS errors, like mentioned above. A lot of us were having issues with finishing up posts, then not backing it up before trying to post, and losing the contents. That's not really an issue anymore, we just never moved back after we'd already settled in. 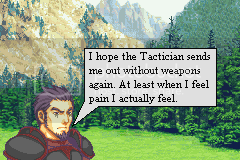 As for the RP itself, the world is very Fire Emblem-esque, with magic, wyvern riders, swords and whatnot. The government of the world is divided into clans, with the Celestial Alliance being the primary one for RPers to take part in. Right now the RP consists of other members of FETO, but anyone is welcome to join. While I have no personal reservations to moving the RP back to here, I actually don't think it would really fit with what FEP would be looking for/want. I never RP'd here in the old days of the site, but I know that CA is different than many forum RPs - and on top of that, anyone who's coming here will want a RP specifically Fire Emblem based. I'm sure there will be side RPs and stuff, but it'd be better to have the main one be Fire Emblem focused. CA is set up to cater to beginner and casual RPers; we're not nearly at the word length per post or activity of what a dedicated RPer would want to sign up for. I don't really know enough of the past to suggest what to be doing for FEP's RP life, but I'd assume having 3 dedicated members or so make a new system would probably be good. Take some inspiration from what was enjoyable in the past, try to tweak it and make it better and whatnot. I'd be happy to RP here as a participant if it gets up and running. If anyone needs any code plugged into the forum or server to host an RP, just run the ideas by me, and I'll see what I can come up with. SaS et al. (first mention of him on the new forum, we're all doomed) actually set up a lot of things overlaid on top of the IPB system to do RP-related tasks. People also used FETO for the RP as well, and it was an interesting mix, and a main reason I'm holding onto the old FETO data post-reset and trying to set up a "FETO Museum". 1. Modern browsers (Firefox for instance) keep the content of your textboxes in session and bring them back when you hit 'back'. 2. The "Save as Draft" button by the Preview/Submit buttons. Really, in the last attempt of creating RP, it seemed like people thought too much about the setting and it never came out then gone with the wind. So I think a simple easy-to-play RP, that people can help shaping it together, would be ideal for now. Then we can update new patch once we have enough RPer to get more serious. (01-27-2014, 09:23 AM)WyvernSlayer Wrote: Seconded. Really, in the last attempt of creating an RP, it seemed like people thought too much about the setting when it never came out, then it was gone with the wind. Let's start out with something basic. There are a whole bunch of really creative members here, and with a basic formula, the world can be built by member interaction. I'm a member on a site whose RP started out as a very basic Order/Good vs. Chaos/Evil conflict between the two nations that made up the world. Now, it is about two or three thousand IRP years later, there are about twelve gods/goddesses that all bicker like children, there are about thirty factions that a player character could start out as, and the landmasses and continents were rearranged three separate times, and that expansion was thanks to about two or three members introducing new creation myths that welded discrepancies in the plot and made everything a hell of a lot more complex, as well as a couple in-jokes about some errors on the forum. Currently that site is down for repairs (something about licensing changes and updates and all that other stuff), but still, that site was opened in 2003/4. We can do better, all we need to do is start with the basics. Perhaps a Chaos/Good vs. Order/Evil Fire Emblem-esque RP with Awakening classes? Also, WyvernSlayer, you had me pegged. I like fire emblem, but I like the RPing better.